FOR SALE - BOLIVIAN TAYLOR MADE, full bolivian male. Born June 26, 2002. HCLA Bolivian Soul Man x HCLA China Doll (Twister x Pop Tart). 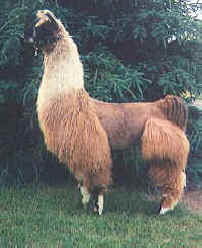 Taylor was first in his class and Grand Champion at the prestigious Parkland Breeder's Sweepstakes in Canada as a yearling. He is a super suri siring world class show animals. Taylor is the sire of show winners WF Canadian Idol and Bolivian Serena. NOT FOR SALE - WARRIOR SPIRIT, born June 21, 1997, Full Chilean, Silverspirit x Wairoa. 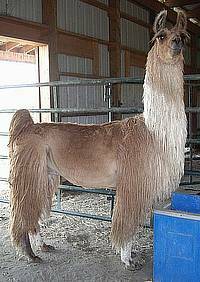 Siring world class show llamas! Updated by Donna Clark, 01/02/14 09:37:56 AM.